BC Forest Discovery Centre: Elusive Brown Creeper - Spotted! Elusive Brown Creeper - Spotted! 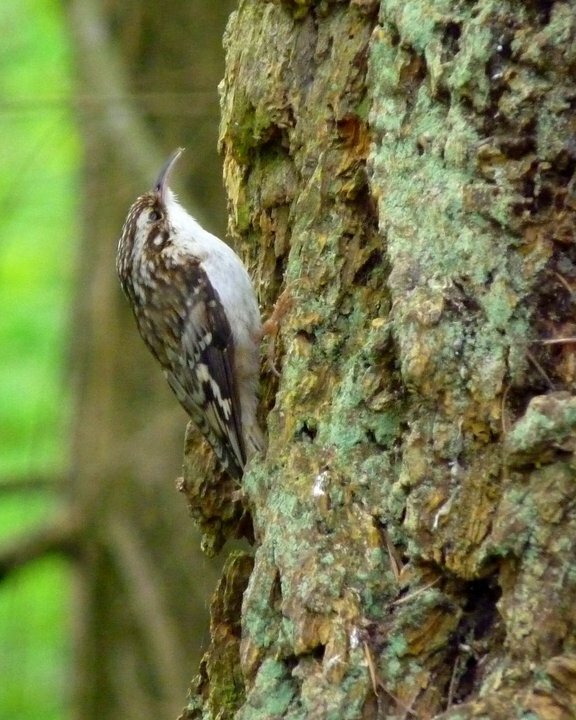 The brown creeper is a well-camouflaged and difficult to spot bird who lives in the woodlands. One was spotted at the museum near the end of May. It was spiraling its way up our 400-year old douglas fir, searching for food in the bark. Brown creeper nests have two entrances - one serving as an exit and the other as an entrance.The entrances face downwards and exits face upwards. The nests are almost always placed behind a loose flap of bark and are constructed of cocoons and spider egg cases, as well as other pieces of debris. They lay one to eight eggs at a time which are coloured white with reddish or pink spots. Look carefully as you walk through our old growth forest for the brown creeper or its nest, carefully hidden in the gnarled bark of the trees. Samson's Second Day Out - With Peter at the Helm! Samson is Out and Ready to Go! BC Day is Kids Day!